Steven Spielberg take note: the story of Katie Mathews and her service dog, Cowboy, has blockbuster film written all over it! 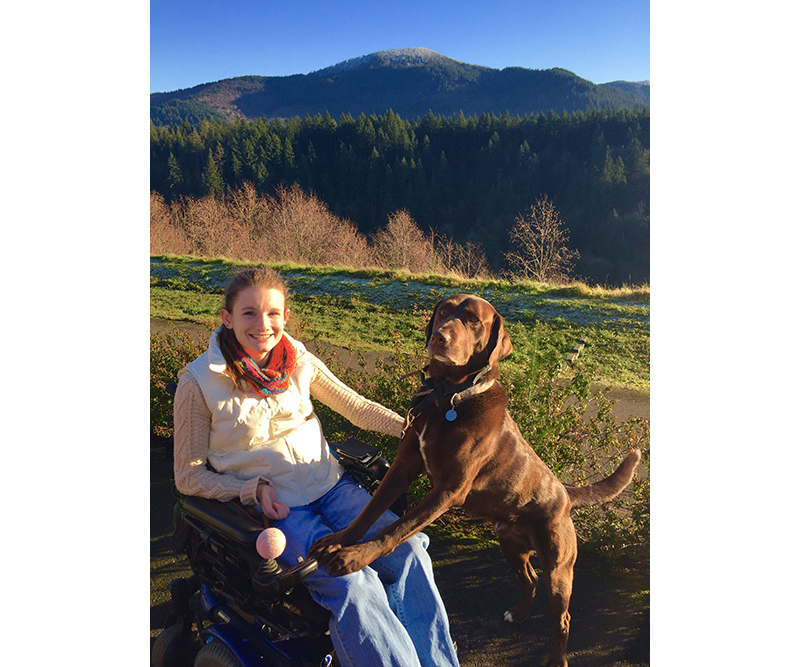 Katie, an intelligent, kind and beautiful young woman, who by God’s grace, the love of family, friends, and an extraordinarily cute, brainy and compassionate service dog, Cowboy, overcomes life-changing challenges that would have defeated most people. A conqueror, in every sense of the word, she goes on to inspire millions as a motivational speaker and writer. That is the stuff movies are made of. 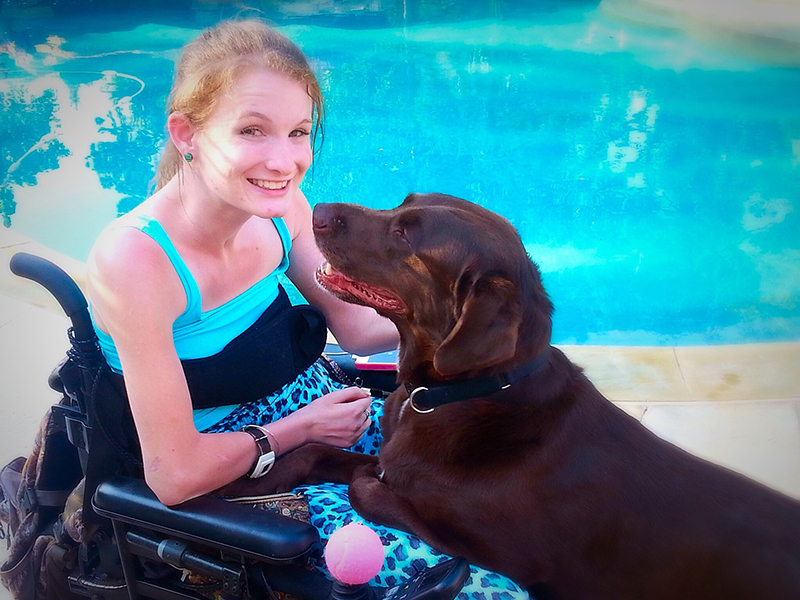 Now living on the west coast, Katie, 25, became a quadriplegic after a car accident in Venice, Florida, when she was 16. She sustained a C6 spinal cord injury which means she has no control over any muscles below the chest level, including her hands and fingers. After two weeks in a coma, months in hospitals—one which specialized in spinal cord injuries—Katie returned to Venice High School. Supportive friends and classmates elected her Homecoming Queen her senior year and she enjoyed her prom. Katie laughs remembering, “On prom night, when the limo bus came there was no ramp for my wheelchair. Several of the guys in our group were football players. They picked me up and put me in the bus and put my wheelchair in the cargo area.” High school ended on a positive note, the way it should: happy memories and good times with good friends. After graduation, things got harder. Friends were going off to college, and Katie, an honor student, wasn’t sure if that was something she wanted to do anymore. Depression and loneliness started to take over. Two paths. The easiest, of course, and the one of least resistance, would be to give up. To succumb to anger, depression and feelings of hopelessness. But not Katie. Katie chose the road less travelled. And for Katie, and those she inspires, that has made all the difference. Instead of following a traditional college path, Katie decided to focus on learning to live as a quadriplegic. She went to Neuro Restorative, in Orlando, a transitional living facility, that specializes in services for those with brain, spinal cord and neurological challenges. Katie was inspired by the story of Donna Marini, also of Florida, who years earlier sustained a similar spinal cord injury, also from a car accident. Meeting Donna, a beautiful, vibrant woman, who lived independently and became a success in acting, modeling and business, was the spark Katie needed. Donna’s accomplishments gave Katie the hope and courage that she, too, had the potential to live the life of her dreams. For the next eight months Katie began the arduous process of re-learning how to do everything: get dressed, shower, care for herself and her home, and function independently in the community. The days were often long, hard and frustrating. Things that had been simple and taken no thought before—like putting on clothes or getting something from the refrigerator—became herculean obstacles. Quitting wasn’t on Katie’s agenda, but the thought, some days, was tempting. Katie reached her goal of living independently, but found that it was a bit lonely. 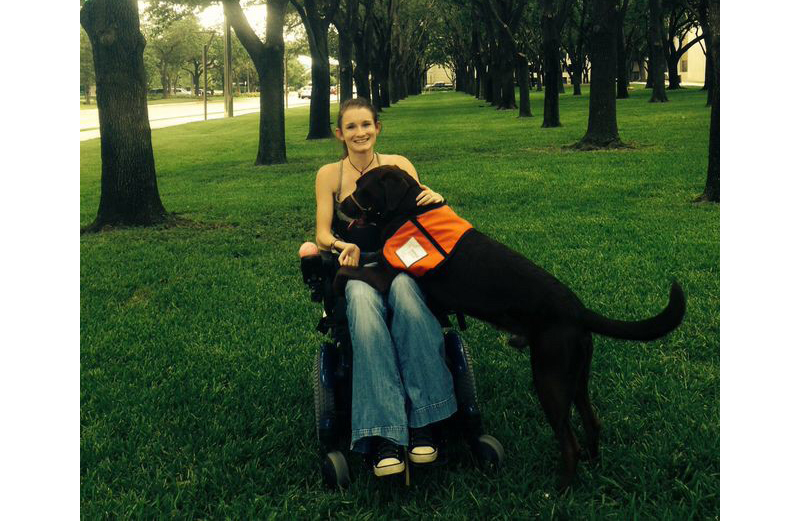 Katie and her mom investigated many service dog organizations, but were turned off by the negative dog training techniques most used. Neither could stand the thought of dogs being punished or forced to cooperate. 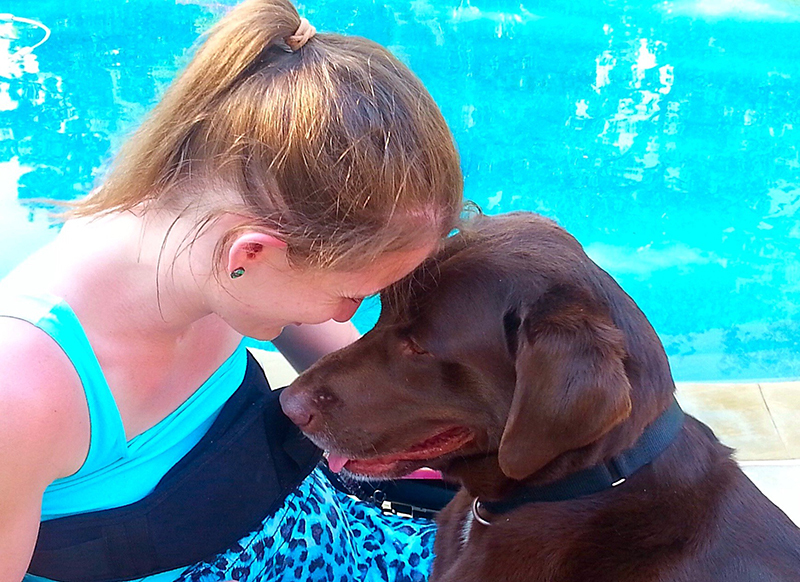 Cowboy, an adorable Chocolate Lab mix, reminded her of the labs she had growing up as a child. And while Katie couldn’t “pick” Cowboy, as miracles happen, he “chose” her at the Service Dogs Inc. training facility in Dripping Springs, Texas. Katie says that Cowboy’s presence gives her confidence and together they are impacting the world in a positive way. As a motivational speaker, Katie (with Cowboy by her side) speaks to high schools and groups of young drivers across the country about the dangers of distracted driving. Texts, emails and Facebook messages from teens she has inspired are the motivation to keep her going. Today a simple blessing for Katie involves a walk with Cowboy, and her mom, who lives nearby, to enjoy the crisp winter air on a Pacific coast day where the temperature is hovering in the low 40’s. The late December sun gently touching the mountains is not as bright as Katie’s future. Katie has started college, taking a communications class, with the goal of becoming a social worker. A hospital nearby is building a rehabilitation center for people with spinal cord injuries. Maybe one day she will work there, as a counselor, to help others down the path she’s navigated so well. Katie might write a book about her experiences. It’s more than evident that Katie can do anything she wants. A life without limits. And Hollywood may be calling. Katie and Cowboy’s story just might make it to your local cinema. Everyone loves a modern fairytale, a story about heroes and overcoming all odds. That’s Katie and Cowboy. Stay tuned. Award-winning author Janis Gioia specializes in writing about not-for-profit organizations, education and children with special needs. For more, visit www.janisgioia.com.